In order to help you get your diet on track, we are now offering the Evolve Warrior Nutrition Plan. 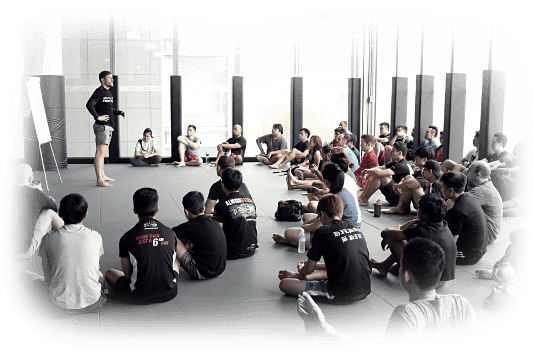 Developed from the performance-based diets of Asia’s most decorated professional fight team, the Evolve Fight Team, the Evolve Warrior Nutrition Plan is designed specifically to help you become the best version of yourself possible. Through this program, you will have the opportunity to sit down with one of our Health and Nutrition experts and develop a customized nutrition plan. You will be in the best shape of your life, feel absolutely amazing, and live life more fully. Our plans offer solutions to almost any health issue from weight loss to high blood pressure to nagging injuries or to satisfy the simple desire to get more out of life. The plan will also improve athletic performance through the ability to train harder and recover faster. At Evolve MMA, we do not believe in fad diets or quick fixes. We believe in long lasting, healthy dietary solutions that you can follow for the rest of your life. Eating healthy doesn’t have to be a phase – it can be the start of a new lifestyle. Through our Warrior Nutrition Plan, we will teach you a new way to eat. We will teach you about balance, variety, and moderation so that you can feel your best while maintaining optimal energy levels. It will help you recover faster from intense workouts and prevent future health problems. While training hard and pushing yourself in the gym daily is critical to your ultimate success, it will not be the enough for you to reach peak performance, lose weight, or get the results you really need. To become the very best version of yourself, you’re going to have to make sure that you’re not just training right, but eating right. A nutrition plan plays a huge role in fat loss and will be the backbone of your day-to-day performance. Experts believe that nutrition determines the success or failure in every aspect of your daily life; from how you go about your daily activities, to performing at your best in training. It also plays a huge role in your overall health now, and in the future.